The constellation "Little Horse" is also known as the "Foal", and consists only of four visible stars which does not impress much. The shape of the constellation is like that of a little horse, and only one of its stars is brigter than size 4. 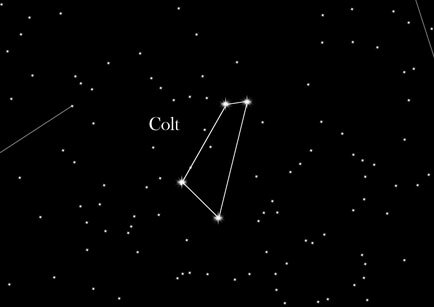 The constellation "Little Horse" is one of the smallest constellations in the sky, the only one smaller is the Southern Cross. Next to this constellation you find the constellation Pegasus. In Greek mythology, one myth associates Equuleus with the foal Celeris (meaning "swiftness" or "speed"), who was the offspring or brother of the winged horse Pegasus. Celeris was given to Castor by Mercury. Other myths say that Equuleus is the horse struck from Poseidon's trident, during the contest between him and Athena when deciding which would be the superior. Because this section of stars rises before Pegasus, it is often called Equus Primus, or the First Horse.